When you discover bed bugs, the first thing you will want to do is wash your bedding and replace your mattress. But, this won’t make any difference long-term, as you need to tackle the problem head on. For most people, the poison of choice would be an effective bed bug spray. While some resort to cheaper brands, I would suggest using what the hired professionals use. THE MOST EFFECTIVE BED BUG KILLER - Journal of Economic Entomology published university study confirmed that EcoRaider is the only natural product that kills bed bugs with 100% efficacy. PROVEN THROUGH USDA IR4 PHP PROGRAM - field tested by research entomologists for eradicating bed bug infestations in public housing buildings and recommend for sensitive environment. KILL ALL STAGES INCLUSIVE & EVEN RESISTANT BED BUGS - Kills adults, nymphs fast on contact with 100% efficacy, kills bed bugs that are resistant to traditional pesticides. Highest performance in eliminating bed bug eggs. EXTENDED DRY RESIDUAL PROTECTION - University study shows EcoRaider residual provides extended protection for two weeks on bed bugs even after dried. NON-TOXIC, SAFE AND ECO-FRIENDLY - certified USDA BioBased insecticide, dermatologically safe; child and pet friendly; safe to use directly on mattress and box springs. 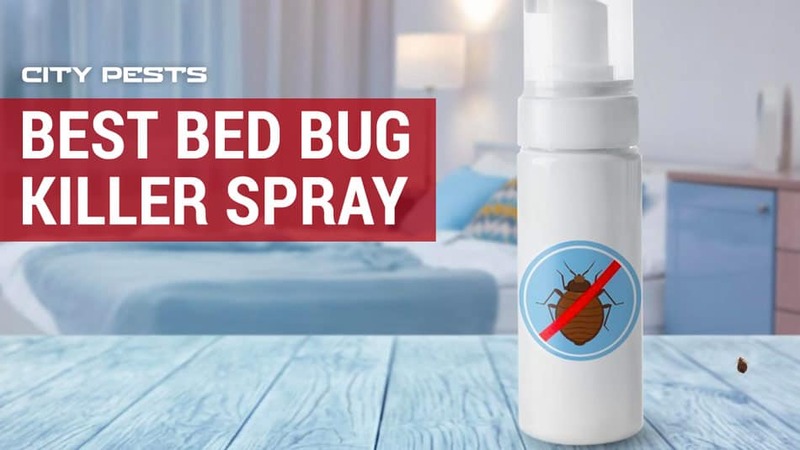 If you have kids and pets and want to do more for the environment then this non-toxic, safe and eco-friendly bed bug spray is the perfect weapon of choice to spray around your home. Made from natural and botanical ingredients it has a pleasant cedar/eucalyptus odor and is easy to apply. 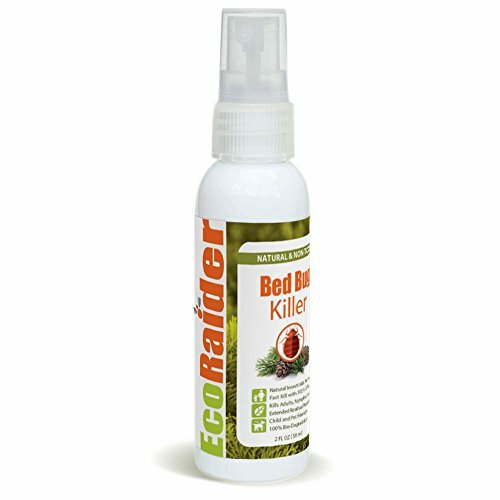 What I really like about the EcoRaider (see on Amazon), is that it is specially formulated so that it doesn’t include traditional pesticides that some bed bugs are becoming resistant to and claims to kill 97% of all bed bugs no matter what life stage they are at. Its long-term effectiveness has also been studied by the Rutgers University, with results showing it continues to be effective two weeks post application. For those who are always on the move, EcoRaider also comes in a handy travel-sized version that is easy to pack into your luggage case. 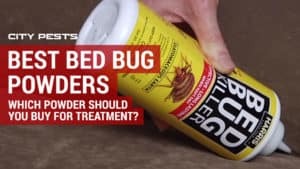 Some bed bug sprays, such as the EcoRaider, have a strong scent which can be overpowering and takes a long time to dissipate. I always recommend using Harris if you are unable to ventilate your property or have a sensitive nose as this bed bug spray is odorless. This spray is tough, and I would advise trying this if your bed bugs have shown a resistance to other brands as it not only kills bed bugs on contact yet continues to kill for up to 16 weeks post treatment targeting eggs, nymphs and adult bed bugs. 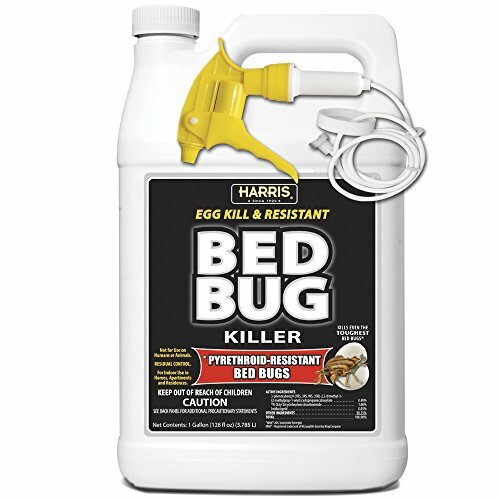 The Harris Toughest Bed Bug Killer is registered with the EPA and considered safe to use around people and pets. Please note, however, that it does contain chemicals, so I personally would avoid using this around children and animals. NO MORE SLEEPLESS NIGHTS - A concentrated blend of ingredients found in nature that stop bed-bugs in their tracks so that you can rest easy again. FAST ACTING, STAIN FREE FORMULA - Specially formulated for use on bedding and mattresses, our non-staining solution will leave you wondering why you didn't try it sooner! A FAMILY SAFE SOLUTION - Carefully formulated with the safety of your family in mind-yes, even the furry four-legged members! Our powerful solutions are safe to use around your children, your pets, and your home. MADE IN AMERICA - Proudly made in the USA, we source the power of nature to give you eco-friendly solutions you can count on. 'PEST FREE' GUARANTEE - You deserve a stress free life. Not happy? Send a message to our Customer Happiness team and we'll make things right. Say goodbye to all your Pest Peeves! I love a product that not only claims to work, but one that is backed by certified research and reviews. This relatively innovative eco-friendly spray uses real-testing results and video’s within in its marketing to prove its success, and I have to say having used it myself I agree with the hype. Just like the EcoRaider, the Pest Peeve Bye Bye Bed Bug Spray (check price on Amazon) is great for those who have children or pets as it is made from natural ingredients. It is also odourless and won’t leave behind any stains after spraying. The bottle nozzle is versatile and comes with several spray options, allowing you to penetrate all those difficult to reach places. 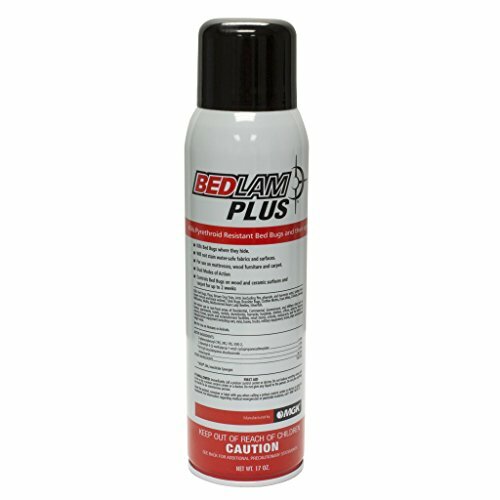 This spray leaves a residual effect and can target bed bugs at all stages of life. For use in: Indoors where bed bugs and other labeled insects hide. Seller is an independent company and distributor of pest control products. Seller can not warranty or guarantee the safety of the products listed on our website as this solely lies with the manufacturer of the product. Products sold on this site are sold throughout the world and it is impossible to know every licensing restriction or requirements, product registration, etc. for every country, state, county, city, province, etc. It is the sole responsibility of the purchaser and the end user to provide a license, permit, registration or whatever is required by their local or state authorities to purchase said product. This is the spray that most professional pest control experts recommend. Why? Because it is the very one we use ourselves. I love Bedlam Plus (see on Amazon) and have used it on some of the worst bed bug infestations I have encountered with great results. It even claims to kill pyrethroid resistant bed bugs. That said, for those with a sensitive nose, a word of warning…this bed bug spray stinks. The strong stench can be likened to smelly feet, which could be why it is so effective at killing bed bugs! 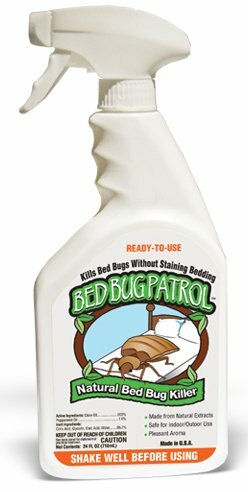 This is another spray that kills bed bugs from eggs to nymphs to adults thanks to its residual effects, which last for up to 2 weeks. Again, due to its toxic nature, I would strongly recommend that you do not use this product around children and pets. 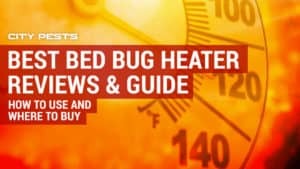 Following on from the Bedlam Plus, if you are looking for something that smells good as well as works great, then the Bed Bug Patrol is a brilliant solution. Made from the natural plant extracts of peppermint and clove oils, the active ingredients in this spray are non-toxic and the scent is pleasant. This product promises to kill bed bugs on contact yet has a residual effectiveness that has been proven to kill 91-92% of bed bugs within a 10-day period post treatment. It can be used on mattresses, covered furniture and surfaces without any damage. Most people choose an insecticide-based bed bug spray to fight an infestation. These sprays tend to come in two different forms – contact and residual. A contact spray does exactly what it does on the tin, and once sprayed directly on the bed bug itself will kill within a matter of minutes. This is great and effective on the bed bugs you can see, but highly ineffective on the ones that you can’t. Not to mention the eggs that lie in wait. 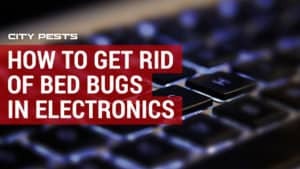 Therefore, my preference is always to apply a residual bed bug spray in any situation as they continue to work days after application – killing anything that walks in its path. Use a bed bug spray containing deltamethrin. I particularly tend to choose the sprays that contain deltamethrin, as they are water-based, and you can apply them liberally to your couches, chairs, carpets and mattresses without the worry of damaging or staining your soft furnishings. I would also advise spraying those hard to reach areas, crack and crevices and around the feet and headboards of your bed. In addition to this, I would strongly advise treating your suitcase and luggage. 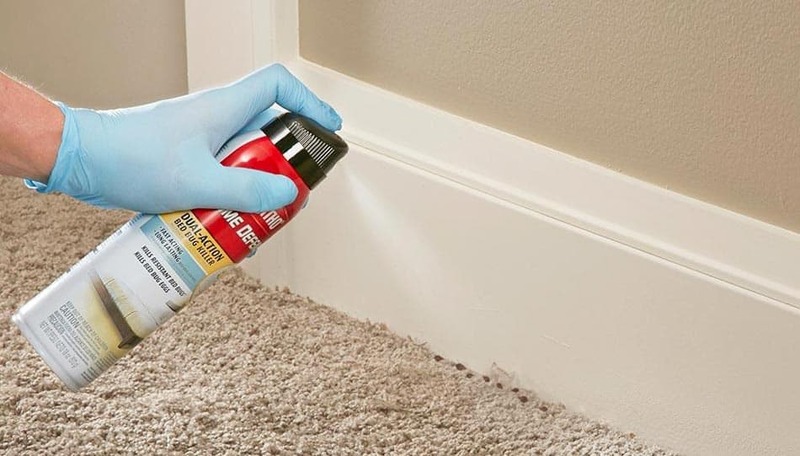 As residual sprays last longer than contact sprays, you can rest easy knowing that the chances of eradicating your bed bug problem in ongoing. This is not to say that contact sprays do not serve a purpose – I honestly think they do. If you see bed bugs crawling around your mattress then a direct hit from a contact spray is the most efficient way to get rid of it – and highly satisfying too. 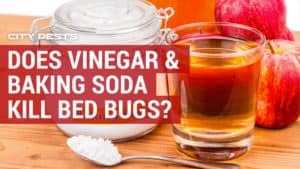 I have covered this in detail in others blog such as How to repel bed bugs and How to get rid of bed bugs with a vacuum, but you when treating these little beasties, it is always best to ensure that you treat the cause as well as the problem. 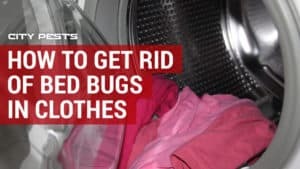 Therefore, always make sure that you clean your bedding in a high temperature wash, move furniture away from walls and ensure that it is as difficult as possible for the bed bugs to climb and crawl. Getting rid of clutter and mess also makes hiding and nesting places harder for the bed bugs to find and makes them more visible to you. Vacuum or steam the carpets regularly, ideally with a professional cleaner, and ensure that your appliance is fully emptied and washed away from the house. Use a combination of contact and residual sprays to combat the infestation. Make sure that you spray evenly over all surfaces and furnishings (including suitcases and bags) and within all nooks and crannies. After treatment, you should carry out some preventative methods to ensure that the bed bugs have fully vacated your property. This includes placing interceptors on the legs of your furniture to catch any stragglers trying to climb back on board and encasing your mattress to suffocate any that may have burrowed deep into the lining. After 7 days of lying in wait you should notice a big difference. If the biting continues then the process should be repeated. Remember, bed bugs are tough, and it is not unusual for treatment to have to be carried out multiple times to ensure a satisfactory result. 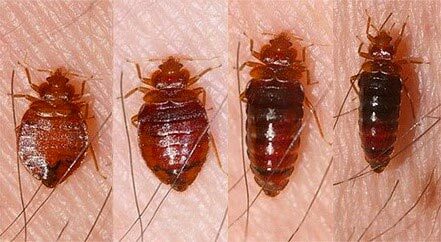 America has been plagued with bed bugs for the past 10 years, with some of the largest states featuring in the top 10 most infested cities. Bed bugs are notoriously hard to get rid of and will follow their host everywhere, even on vacation. 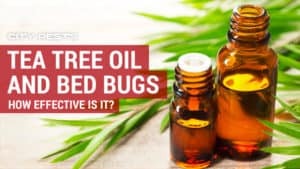 So, with bed bugs fast becoming the bane of our lives and with Parisians now starting to blame American tourists for their latest summer outbreak, it is imperative that we bite back with fast acting residual sprays and solutions. What is a bed bug and what is its life cycle? From a hospital to a hotel, a mansion or a mini apartment, bed bugs will reside anywhere they can find warmth and enjoy a good gorge. And the scary thing is, you could be sharing your bed with them right now and not even know it until it’s too late. A bed bug can be as small as a speck of fluff yet can grow to be 5mm in length. A bed bug can lay up to 5 eggs a day and will hide them in the smallest of gaps and crevices. Milky white in color, these eggs look like a grain of salt and are inconspicuous to the eye. A bed bug egg will take up to 2 weeks to hatch and upon arriving into the world they will seek out a host in which to feed from immediately. These youngsters, or nymphs as they are often referred, are yellow-white in color and ravenous in nature. After a 5-week feasting period these nymphs start to enter adulthood. Now the size of an apple seed and balloon like in appearance, an adult bed bug is easier to spot. Having indulged in a drink at least once a week, their bodies will turn from brown to blood red. The average lifespan of a bed bug is around 4-6 months, but I have heard of some infestations were the bugs have lasted for up to a year! Depending on the climate, bed bugs can go into hibernation and live happily without feeding for a good few months, so don’t be fooled by their sudden disappearance. Once spotted you need to act immediately with a residual bed bug spray if you ever want to enjoy a good night’s sleep again. Are bed bugs becoming resistant to insecticides? The main ingredient in bed bug insecticides is deltamethrin. This is a pyrethroid chemical that works by affecting the nervous system of the bed bug and paralyzing it. 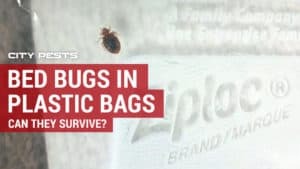 There has been some research to show that bed bugs are becoming resistant to this standalone chemical and I would always advise using it in combination with other treatments such as liquid insecticides and powders to stop them from spreading. 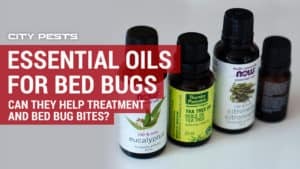 I don’t normally sit on the fence when recommending products, but in the case of these bed bug residual sprays, I would always try a combination of treatments. There is very rarely one product that can be used for every area of the home, for example, some products come with nozzles for those hard to reach cracks and crevice’s whilst others are able to be sprayed near electrical outlets or can used if you have pets. Also, by using a variety of sprays will help to avoid any issues with chemical resistance. If you can stand the smell, however, then I would recommend trying Bedlam Plus, as it is by far the most effective but certainly hard to stomach – especially if you require multiple treatments. Please remember, that relying strictly on residual sprays alone is generally not a good solution. The most successful methods long term for a serious infestation would be to either carry out deep cleaning and heat treatments, using specialized vacuum cleaners and steamers, in addition to preventative methods. I appreciate, however that for many getting rid of bed bugs, even using off the shelf solutions, can be incredibly time consuming and costly. Thanks for this useful information on best bed bug sprays! I found the Eco Raider works well.